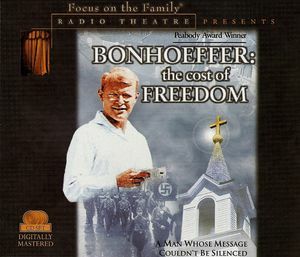 In this episode of Audio Theatre Central, JD, Roy, and Andrew review Focus on the Family Radio Theatre’s drama Bonhoeffer: The Cost of Freedom. This audio drama was written by Paul McCusker and was the recipient of a Peabody Award. The guys also mention a great Easter story for children called The Story of Little Tree. This musical is a fun as well as thought-provoking drama that will especially appeal to younger listeners. And of course, Roy has another newscast that contains some breaking news. Purchase Bonhoeffer: The Cost of Freedom from our affiliate partners. Join the ATC Insiders mailing list!